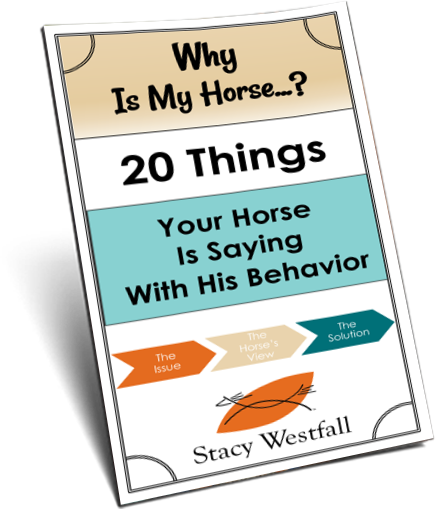 Do you get ’emotional’ when working with your horse? The one thing I have noticed ….. when working with the horses, you don’t show any outward emotion. All your actions are non offensive even when you are pushing them away or driving them. This is the part I struggle with when I work with my own horses, I get emotionally charged and they know it, I take any disrespect personally and I show way too much emotion. When I help out others I can be much calmer as I don’t have that emotional connection to their horse. Weird, I know. Any tips? Actually I don’t think it is weird at all. If you know that being calmer tends to work better…why would you not ‘be calm’ when it is needed the most…with your own horse? The answer may vary from person to person but one reason I see over and over is that we think OUR horse is a reflection of us. 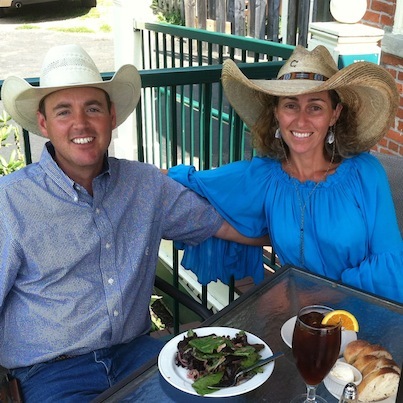 If we are handling ‘someone else’s’ horse and things aren’t going well, it is easier to keep from being emotional….it is less likely that people will think less of you if it doesn’t go well. It is tough to be connected and not think that the ‘connection’ automatically causes that horse to be a direct reflection of you. What if instead of your horse we said you had this same reaction with your kids or your spouse? I know that personally it was hard for me earlier in my marriage when my husband and I had different thoughts on a subject. I would get emotional because it seemed like his thought (which I disagreed with) would reflect poorly on me…after all, he is my husband. Learning to accept that each one of us, horse or human, is unique…and that is a good thing….has been a wonderful life lesson. Difficult at times when they challenge me. Rewarding when I grow from the challenge. And the real lesson for me is that my reaction to the differences or difficulties says more about me than it does about them. As I have grown I am thankful that I found this ‘balance’ early on with my horses. And I am thankful that I am finding that balance now in my ‘people’ relationships. ← Is training a miniature horse the same as training a big horse? Lessons from owning a mini. Let the emotion come to you. Say you are working your horse in a round pen..when you close that gate..all the rest of your world is left outside, work issues, kid issues, busy day issues. It is difucult at first because we all know that horses are good for us and can help calm us but don’t put that responsibility on your horse. He will synchronize with your anxiety/frustration and it is not his job to help you and it will not be a good time for either of you. Your time together will be more relaxed, fun and successful if you leave your other world outside…partnership with our equine friend is the emotion we seek. Go to the round pen with a simple plan, an open mind and open heart. It amazes me every time how successful our time together is…just by leaving the day’s baggage on the outside. And when you leave the round pen…the “baggage” pile may seem a lot smaller. I think it’s the same kind of thing as family is always the best at pushing our buttons. It’s easier to have your buttons pushed with someone (horse or human) that you love deeply and have a close relationship with. At least that’s what I’ve found. I’ve gotten pretty good at my “poker face” with my horses (and my daughter!) but I’m definitely way more easily triggered with my own horses than other peoples! My mantra: “respond don’t react”. Have certainly learned that lesson from my trainer. Now it’s fairly easy to keep in check. I recognize what you say in myself at times and I have to self correct. Working toward the day that that I become more consistent and you putting it into words is a big help. Thank you. I am so glad to hear I am not the only one that has more patience with other people’s horses than I do my own! I don’t find it wrong to have emotions when handling/training horses. You can’t be completely emotionless or maybe that’s just me. 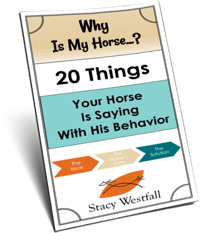 It’s channeling your emotions and frustrations to your advantage, just like a horse needs to do with their energy. I found that a lot with handling young OTTB’s. I could connect with them on a different level using my own emotions as long as I was logical about it. I love your blog and your training videos about Jac. It’s great to see a woman be so exceedingly successful since so many big name trainers are men. You are amazing. You stay so calm when you work with a horse. I totally agree what you project is what they reflect. Thank you for your honesty. What a wonderful question! I am human, so I have emotions. Those emotions factor into training, if my horse is to understand me as well. We meet in the middle so no one feels cheated out of their authentic self. Works for me. Thanks for answering my question Stacy, I have thought about this some more and you’re right. If I relate it to my children it’s like when you go out and they misbehave you feel embarrassed and take their behaviour personally. I have always struggled with the worry that I’m not good enough at working with horses and I worry what other people think, now that I have a young horse to work with I need to believe in myself and ignore the negative people. Your comments were very timely for me today, for totally different reasons. You said “…one reason I see over and over is that we think OUR horse is a reflection of us.” I am struggling with that right now. 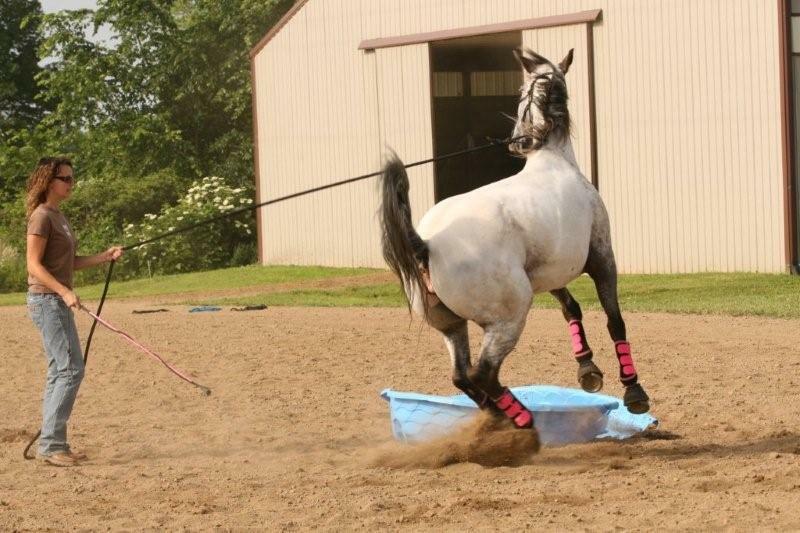 I have 2 Arabian geldings, and for various reasons, I need to sell the one that I bought to be my “show horse”. He’s beautiful, usually fun to ride, and my long time horse is less flashy and a great trail horse, but not as ‘impressive’ as the other. I realize that I am thinking that my horse IS a reflection of me, and I’ve enjoyed the attention I’ve gotten from having a nice horse. But my self worth is not a function of the horse I ride, anymore than the car I drive or the man in my life. Thanks for the perspective!! Having had, and training, horses from a very young age, I learned early to not have emotions when dealing with horses. This worked great for horses, just not in my personal life and relations. It has taken me a long time(I’m 56 now) to recognise and allow emotion to surface naturally when appropriate. Heather, I can relate to your comment also. If we suppress our emotions, they build up and catch up with us eventually. We can appear cold too other people also. I guess it’s finding the balance, that some of us really struggle with.